Former winners of The Bowerman are decorated like a house for the holidays when it comes to international competition. Since collegiate track & field’s highest honor debuted in 2009 at the JW Marriott Orlando Grande Lakes Resort & Spa, former winners of The Bowerman have won a combined 10 Olympic medals, seven IAAF World Championships, five IAAF Indoor World Championships and 22 total IAAF World Championships medals. There have been eight major global track & field competitions since the inception of The Bowerman in 2009 – including two Olympic Games (2012 and 2016) – and former winners of The Bowerman have brought back hardware at seven of those meets. The only meet in which a medal wasn’t earned by a former winner was at the 2010 IAAF World Indoor Championships in Doha, Qatar. The most medals were won at the 2016 Rio Olympic Games when six former winners of The Bowerman nabbed top-3 finishes. Derek Drouin (high jump), Aston Eaton (decathlon) and Brianna Rollins (100 hurdles) each won individual golds, Courtney Okolo helped Team USA to a 4×400 victory, while Galen Rupp and Jenny Simpson (nee Barringer) tallied bronze medals in the marathon and 1500, respectively. 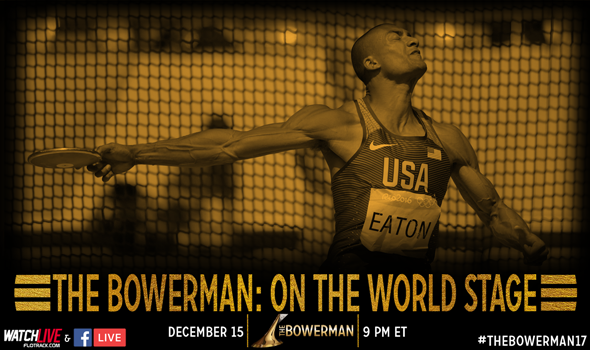 Eaton, without a doubt, is the most decorated men’s winner – and former winner, for that matter. He retired with eight world medals (two Olympic golds) and a world record to his name in the decathlon. Simpson broke a tie with Rollins this past August when she won her fourth world medal after a stellar effort in the 1500 at the 2017 IAAF World Championships in London. Rollins has three world medals, including two golds from the 2016 Rio Olympic Games and 2013 IAAF World Championships. Be sure to tune in on Friday to find out which two athletes win The Bowerman in 2017. All of the action starts at 9 pm ET on FloTrack and Facebook Live.